WHERE DO ALL THOSE PLAQUES COME FROM? Anthem of the Seas receives an offical welcome. On most cruise ships, there is a wall covered with plaques, plates and trophies. 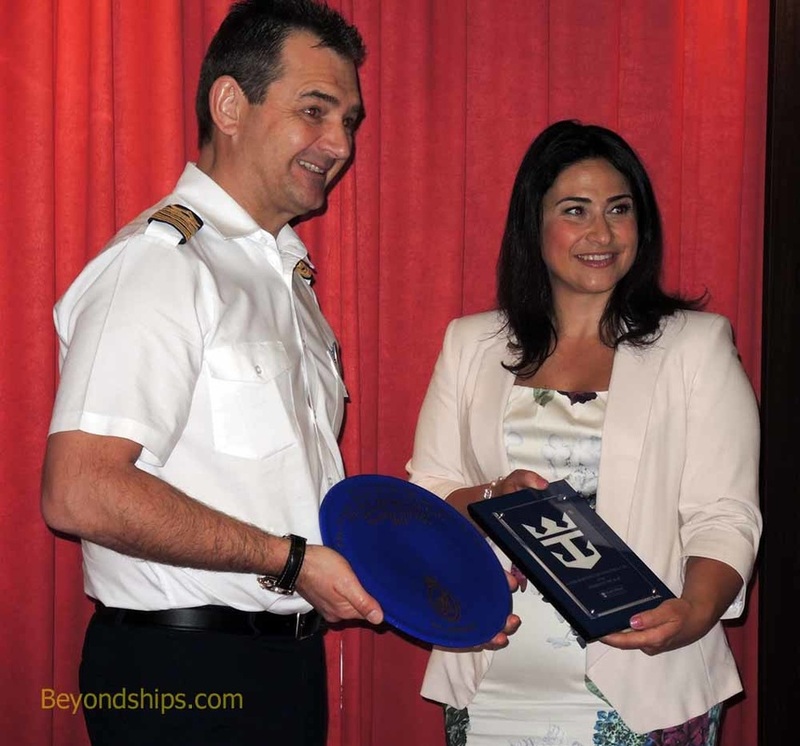 Some of these are awards the ship has received from various trade associations or travel media. However, the majority of these are momentos of the ship's maiden calls at various ports. There is often a ceremony associated with each of these plaques. When a ship arrives in a port for the first time, a delegation of government officials usually comes aboard. The size of the delegation and its composition depends upon such things as the importance of cruising to the local economy and the noteriety of the ship. 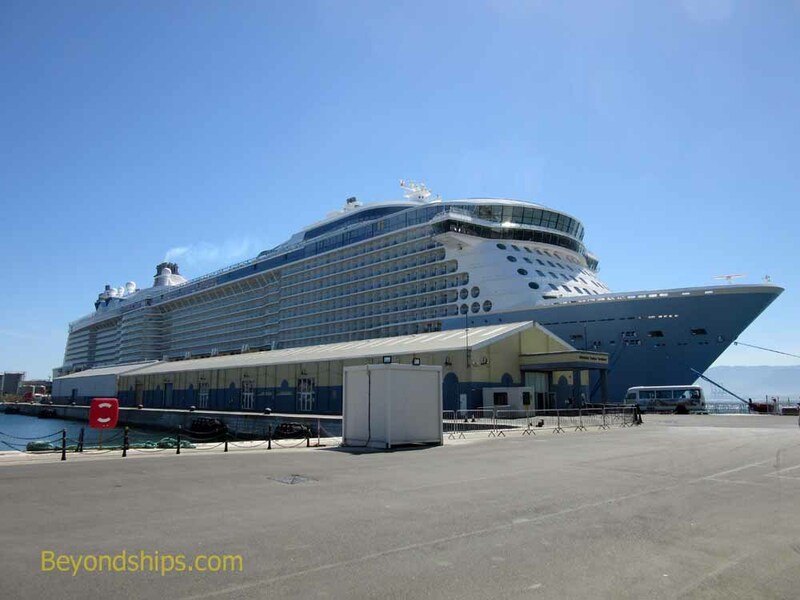 Thus, if cruising is important to the port and/or if the ship has generated a lot of excitement in the press, the delegation will be large and headed by a high ranking official. 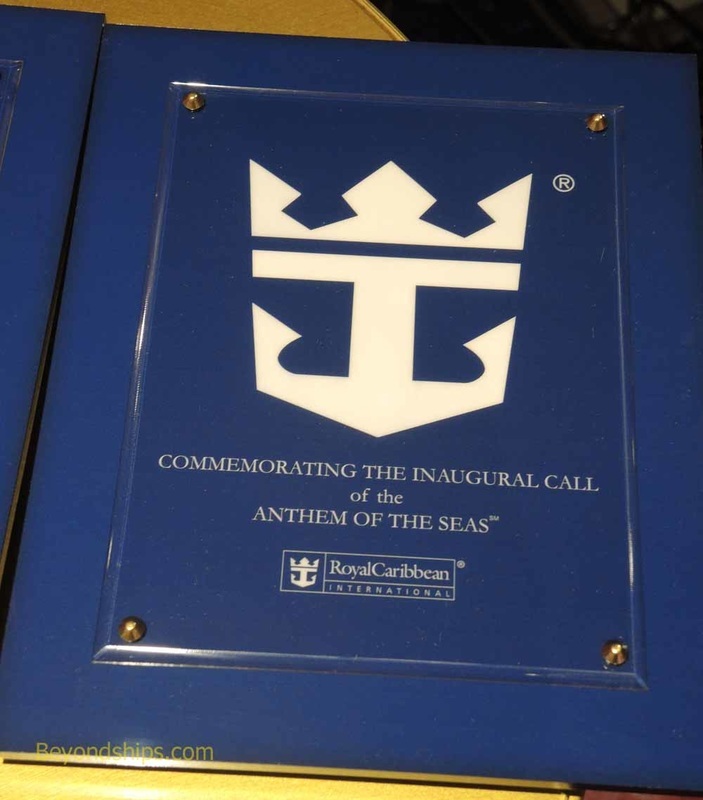 As a new cruise ship that has just entered service, maiden calls are a frequent occurance for Anthem of the Seas. Thus, when Anthem arrived in Gibraltar at the beginning of her first Mediteranean cruise, a sizeable delegation came aboard headed by the Minister of Tourism and the Port and including the captain of the port, the port agent, business executives and members of the loal media. Capatin Claus Andersen and several of his officers met the delegation in the Boleros cocktail lounge. The visitors were offered champagne and after a short meet and mingle, the official ceremony began. The ceremony ended with the presentation of some additional plaques from other members of the delegation. The press took photographs of the participants and then the delegation were taken on a guided tour of Anthem of the Seas. It was a scene that would be repeated several times as Anthem sailed further into the Mediteranean. 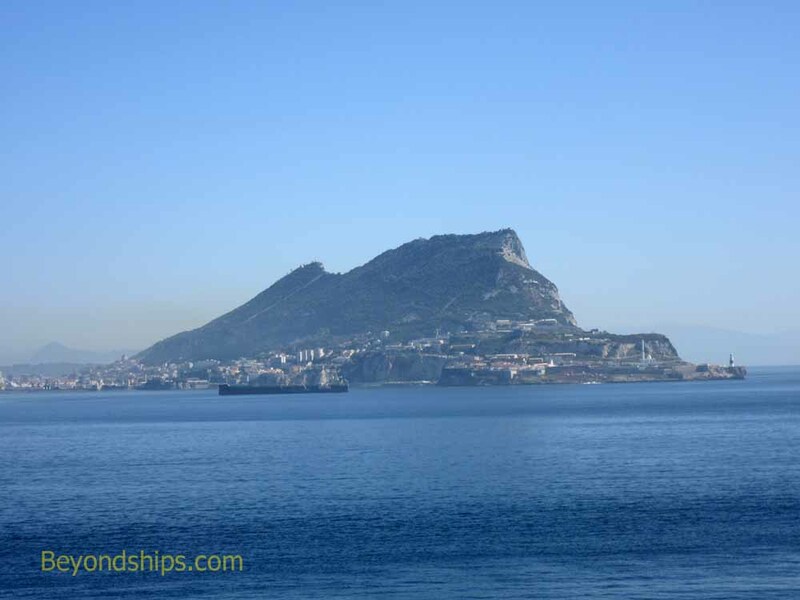 Above: The familiar silhouette of Gibraltar. Above: Capatin Claus Andersen and Minister for Tourism and the Port Samantha Jane Sacramento. Above: The plaque Anthem received from Gibraltar. 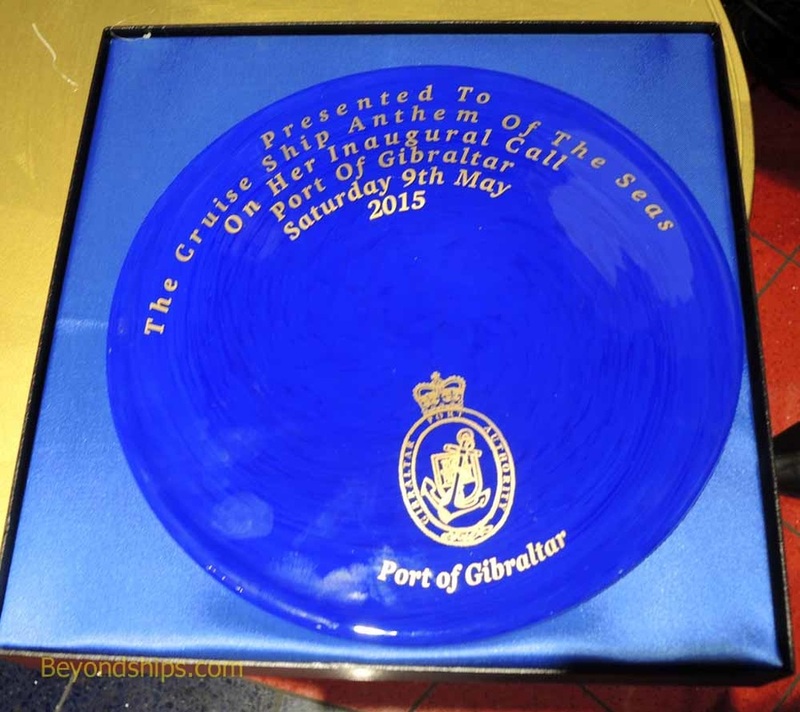 Below: The plaque Anthem gave to Gibraltar.